I keep thinking that if I make soup then we will finally get some real fall weather. It has not completely worked yet but we did get lots of rain last week and it is only supposed to get up to 85 degrees today. That’s OK though because soup is my ultimate comfort food and I love it all year round. Back when we were in a CSA for several years, Swiss chard often made an appearance in our bags (along with many other kinds of greens). In fact, it appeared a little too often for our liking. I must admit I got pretty tired of greens after having them almost every week seven months out of the year. 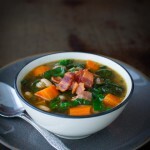 But it did help me discover this Swiss chard soup recipe when I was forced to find ways to use up the greens. Beautiful Swiss chard is definitely a key component of this soup but there is a secret ingredient that really adds to the flavor. No, it’s not the bacon (for once). Don’t get me wrong, bacon is never a bad addition but the real secret is adding a piece of Parmesan cheese rind to the soup as it simmers. Have you ever heard of this trick? It’s a great one to know. After you have grated all the useable cheese off the wedge of Parmesan, store the rind in a plastic bag in the freezer. Then whenever you make a broth based soup like this, just toss the rind in. It adds amazing flavor. The best part about this soup is how versatile it is. If you want a healthier version, skip the bacon and sausage entirely and add more beans and carrots. Or if you are needing to serve both vegetarians and carnivores in one meal, brown the sausage and bacon in a separate skillet and add them to individual serving bowls for those who want them. Whatever version you make, it is perfect for any kind of fall weather you may be having. Add the bacon to a large saucepan or Dutch oven over medium heat. Fry bacon until nicely browned, then transfer to a paper towel-lined plate; set aside. Drain off all but 2 teaspoons of bacon grease from pan. If you do not have enough bacon grease or prefer a lighter dish, substitute in olive oil. To the same pan, add the onion, garlic, and carrots and sauté until the vegetables are tender, about 4 minutes. Add the turkey sausage and brown slightly. Add the Swiss chard and sauté until it begins to soften. Stir in the vegetable broth and beans. Bring the soup to a boil and add parmesan cheese rind and herbs, then reduce the heat to a simmer and let cook for 30 minutes. Taste for seasoning and add more salt and pepper, if necessary. Discard cheese rind. Ladle the soup into serving bowls and sprinkle each serving with reserved bacon. For a vegetarian option, leave out the bacon and sausage and sauté the vegetables in olive oil instead. How delicious does this soup look! Totally loving all the yummy flavours and crispy bacon in it. Definitely a recipe I need to recreate… thanks for sharing it!